"Buffalo buffalo Buffalo buffalo buffalo buffalo Buffalo buffalo" - the iconic grammatically correct sentence to show off multiple meanings for a single word...and what you might say if you stare at Bruxie's newest menu item line-up. They have run with the buffalo sauce flavor in more than one way but don't worry; a new soda is not one of those ventures. Instead, a kickin' salad, fingerlickin' tenders, and solid sandwich are the three ways you can enjoy having buffalo at Bruxie. We've been fans of the restaurant chain ever since it was just the original Orange location and even atended a hard hat tour of the Huntington Beach opening a few years back. They were the first on the Orange County front to bring waffle sandwiches to the area and regardless of the gimmick (that some thought it was), they make some satisfying food. We were invited one afternoon to give their newest items a try, and we left quite happy with what we hope will be truly permanent dishes on their menu! 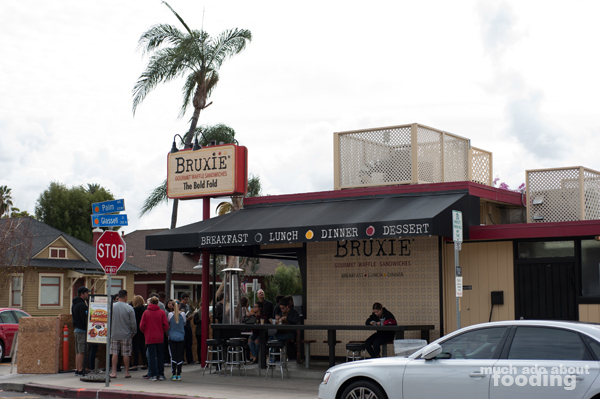 Now, I have my go-tos at Bruxie as does Duc so when we were asked to try out new stuff, we decided it would be better to hit up the original spot for this. It had actually been a while since we had been there since there have been others that have cropped up. Actual awnings and seating areas are built out to allow for plenty of dining space with coverings, and as always, the line wrapped around the building. 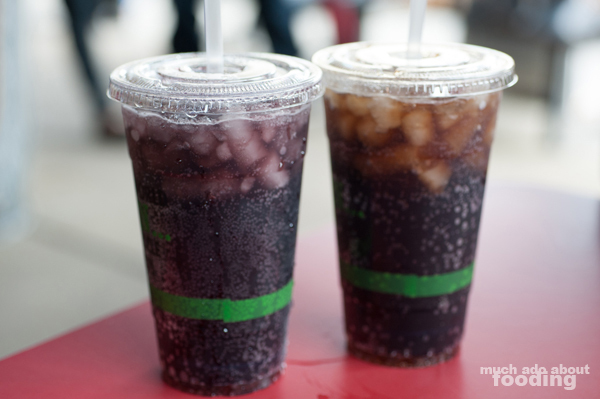 We couldn't resist getting some sodas with the meals even though we rarely drink pop; they just make them so well. The first out to give a shot was the Buffalo Tenders (with Bleu cheese dipping sauce, crispy vegetable slaw, and waffle fries). 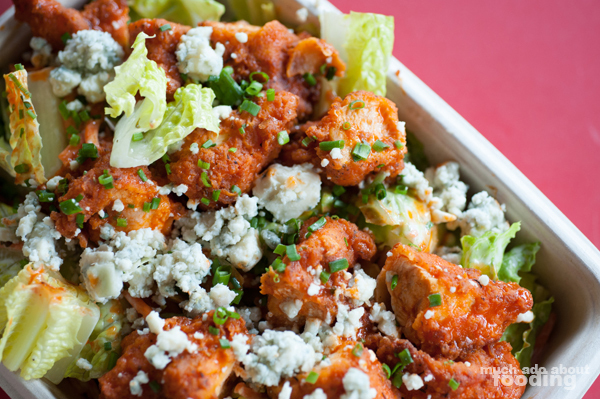 Each of the Kickin' Buffalo Chicken line comes priced at $7.95 which is quite in line with their overall menu. 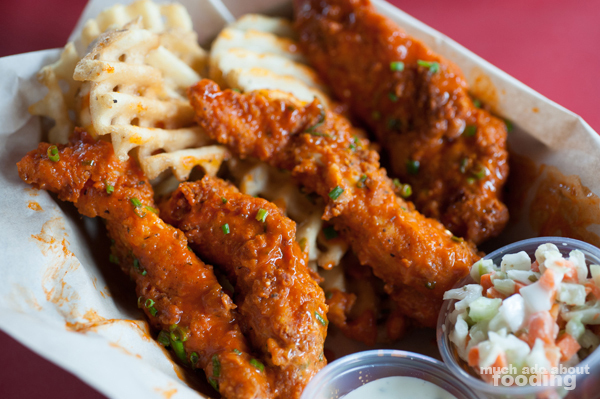 These tenders were moist and savory with plenty of sauce to get your hands all dirty. They were great with and without the dipping sauce, and the inclusion of chopped chives on top gave a bit more dimension to them. Perhaps they could have been presented a little better but other than that, a great share for a group of friends or for the buffalo chicken lover since it was quite a lot of sauce! My favorite of them was their Kickin’ Chicken Salad (herb ranch dressing and Bleu cheese with a Parmesan chive waffle crisp) which combined chunks of buffalo chicken with chopped Romaine hearts. Aside from the satisfying crunch of hardy Romaine ribs, the salad had a balanced mixture of ranch dressing and pungent Bleu cheese. For those who are not too keen on the latter of the two cheeses, the cool ranch cut through it well. There were also thin slices of raw celery in the salad that contributed a different crispness and flavor to the overall dish, giving a break between bites of tangy buffalo sauce. Of the three, I could see this being my go-to. 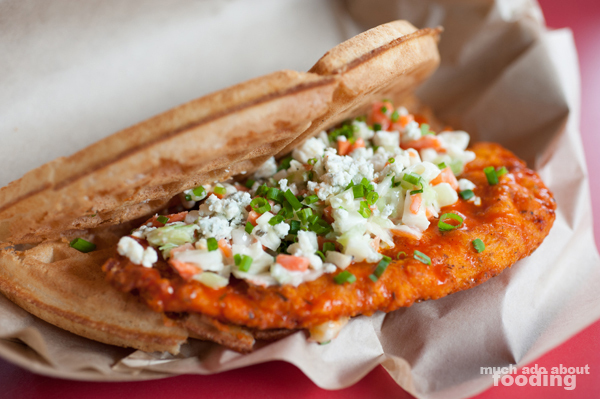 We also sampled their Bruxie Buffalo Bleu Sandwich which came topped with a crispy vegetable slaw and crumbled Bleu cheese. The slab of chicken that came out was a tad larger than the waffle itself so it required some maneuvering to properly eat. However, once we got our bites in, the flavors came together well. I had forgotten how fantastic how the waffle batter was until we dug into this - savory and airy but with enough fluff to buffer against the innards. The chicken seemed on the thinner side though and could have been better if not pounded as thin but overall, still a solid sandwich. 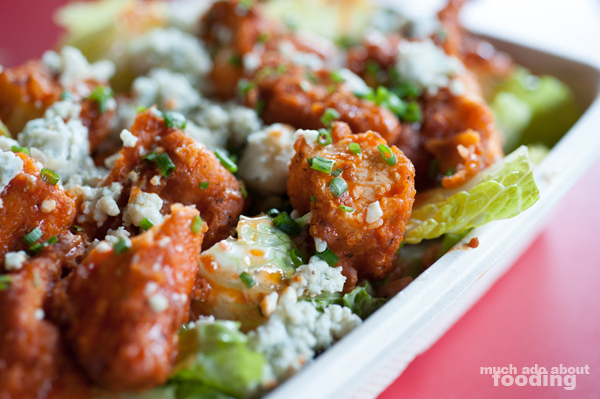 I think adding buffalo chicken tot he menu was a good move; it's a commonly enjoyed flavor! 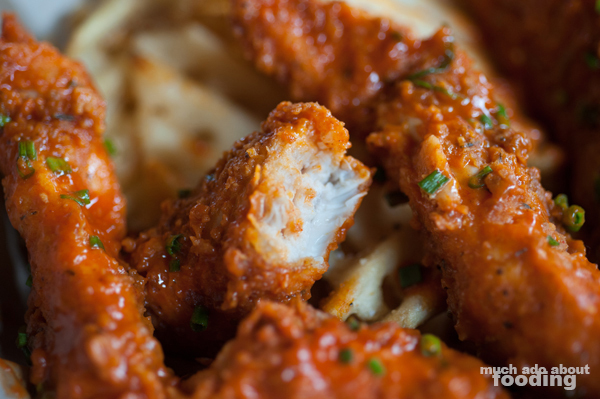 They've got several locations all over Orange County so if you're a buffalo chicken lover, it's not too far. As for us, I think I need to get my teeth on another salad soon!